When choosing a church to get married in downtown Toronto an engaged couple has so many options to choose from. Finding the right one which fits your faith is important and after that it is often the location, beauty or aesthetic that the interior of the cathedral showcases. One of the most beautiful churches in Toronto is the St. George's Greek Orthodox Church with it's artistically decorated main auditorium with 2nd level balcony covered in gold leaf which wraps around the entire building. 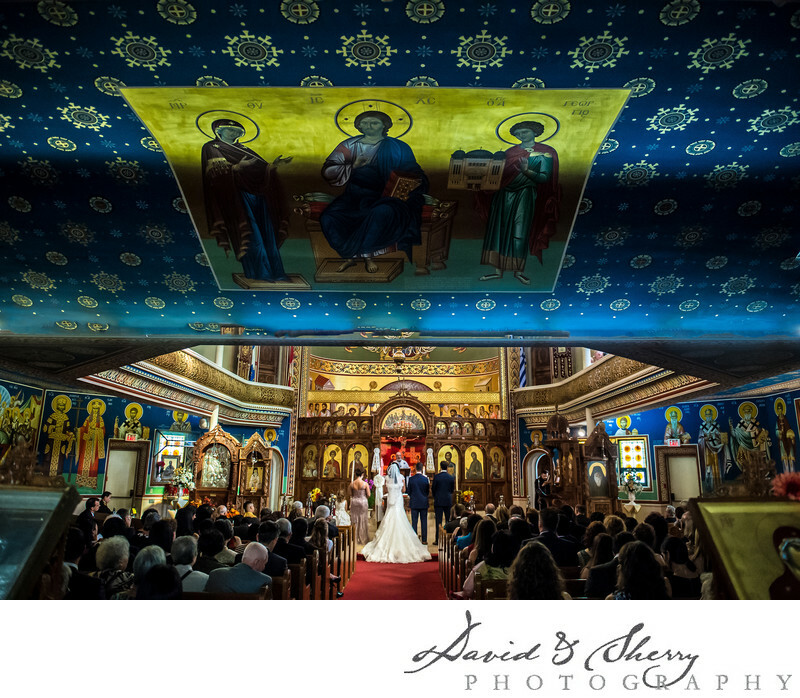 From the gold decorations, the red aisle carpet and the blue accents throughout the church this Greek building which has stood for a century is very popular among the generations getting married today as well as those who have come before us. We love photographing in spaces like this one because the rich colours add so nicely to the finished images which make their way into the album. We love capturing the look on the groom's face as she walks down the aisle, the tears in dad's eyes as he escorts his daughter to the front of the church and each different traditional part to the wedding ceremony. We trust you'll make a good choice in your venue, and would encourage St. George's church as a great option for your wedding. Location: 115 Bond St, Toronto, ON M5B 1Y2.